We also have the pleasure to collaborate with a company which has started to be recognized worldwide due to the excellence of their product and the results they achieved. They reinvented the nature through science offering us a revolutionary product which we believe will have a lot to say regarding our health and well being – Qlarivia. Many thanks to Mr Cristian Mladin, the President of Mecro System SRL, for his trust in letting us represent his brand in Malta. 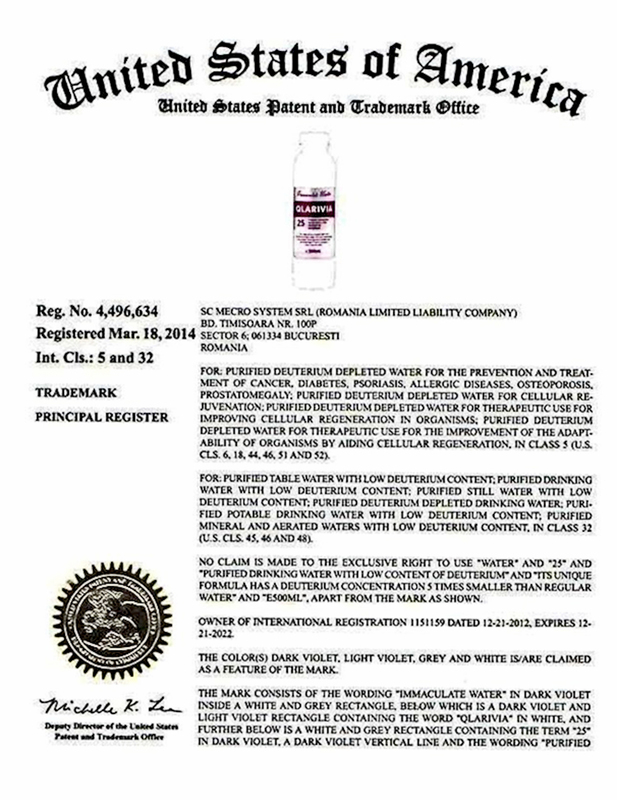 Qlarivia is a drinking water with a concentration of deuterium of 25±5 ppm (parts per million) obtained through a process patented in Romania and internationally protected. The technology used allows obtaining a deuterium depleted water with a deuterium concentration between 1 and 120 ppm. Deuterium depleted water, known as “life water” or “light water”, is water in which deuterium is found in a smaller concentration than in normal water. In average, deuterium is found in a concentration of 150 parts per million, in normal water. That is a rate of 1 deuterium atom for 6400 hydrogen atoms. In the 60’s, in the former Soviet Union, a team of scientists studied two populations, in two different regions. The members of these communities reached very old ages and were very healthy. Their living habits, including feeding, were different, but had one thing in common: both populations used to drink glacier water. The special feature of that water, opposed to regular water, was that it had a reduced content of deuterium, being formed thousands of years ago. The quantity of gases dissolved in the body is four times smaller in the case of children and young people, than in the case of adults. The explanation is that as we age, the water inside our body ages and retains residues and gasses. If we could replace the “polluted” water with pure water, we could offer ourselves a better and healthier life. Deuterium depleted water can help purify the organism. Qlarivia deuterium depleted water is an immaculate, pure water, like the one that existed on Earth thousands of years ago. Qlarivia means reinventing nature using technology. Qlarivia is an unique product with special benefits on the wellness of the human body. Qlarivia has numerous benefits for health. The more reduced the deuterium concentration in the water inside the body, the better for the organism’s wellness. The sportsmen reported a quicker regeneration during the time they consumed deuterium depleted water. From the hard quantifiable effects related on sport we can mention: increases the work capacity, increases the creative memory and removes the anxiety states. Generally for sportsmen the results confirmed that deuterium depleted water causes beneficial changes for the organism which can be observed under physical loading. Regular use of Qlarivia water has many great bennefic effects. The lack of deuterium produces two main types of effects: metabolic and control of the proliferation of cancer cells. Thus, it decreases the need for insulin-dependents, lowers cholesterol and lipids in long-term therapy with effects in treating atherosclerosis, delaying the multiplication of human nontumoral fibroblasts. These are the main quantifiable effects. From the hard quantifiable, can be mentioned increase of creative memory, improving sleep, removal of anxiety states, increased work capacity. Low-deuterium water influences the process of cell division: the lower the deuterium content of water, the lower the frequency of cell division process, which means that body aging can be slowed down. Therefore Qlarivia drinking water with 25 ppm deuterium has anti-aging effects. Remarkable results were obtained in studies on cancer tissues, in research related to diabetes and some skin diseases like psoriasis. Also, low-deuterium water was used by some doctors to help treat various cancers, with surprising results. Evidence in this respect stand the testimonials from all over the world. 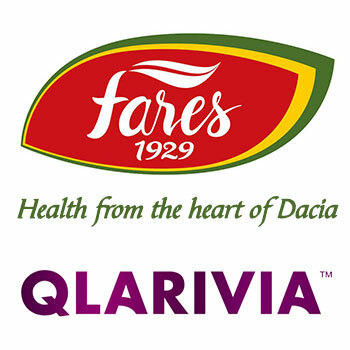 The process for obtaining Qlarivia was awarded medals and prizes at international inventics saloons in Bruxells, London, Geneva and Budapest. The Patents for the process of obtaining deuterium depleted water in the 20-30 ppm D / D + H has been awarded gold medals and diplomas at important invention salons in Brussels, London, Geneva and Budapest and other international awards. Qlarivia is bottled in 500 millilitre bottles, and it’s taste is similar to that of a premium natural drinking water. Think wise, choose wise, live wise.